Kate Childress, a Stephen F. Austin State University graduate student from Lumberton, has been appointed by Gov. Greg Abbott to serve as student regent on the SFA Board of Regents during the 2018-19 academic year. 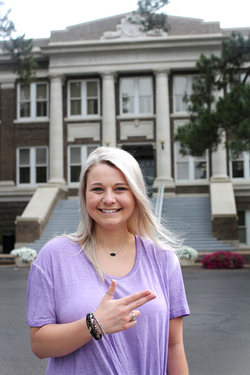 NACOGDOCHES, Texas - Kate Childress, a Stephen F. Austin State University graduate student from Lumberton, enjoys serving others, and in her new role as student regent, she will have the opportunity to impact the campus community in myriad ways. Gov. Greg Abbott appointed Childress to serve in this position, and her term as student regent began in June 2018 and will end in May 2019. She graduated from SFA in May 2017 with a Bachelor of Science in psychology and has continued her SFA education, now working toward a master's degree in student affairs. "I believe my student affairs academic endeavors closely align with my position as student regent," Childress said. "My role as student regent will allow me to simultaneously learn and grow. It is a great learning opportunity for me, as well as one that will help further SFA's mission and vision." While an undergraduate, Childress served as a Jack Walker campus tour guide, SFA 101 student instructor, Jack Camp counselor, Orientation leader and Weeks of Welcome student director. "I fell in love with the opportunity to help incoming freshmen, transfer students and their family members," Childress said. "Each student and parent is different. I enjoyed having an impact on the lives of students and the satisfaction in helping parents know their student was coming to a university with good people on their side. I'm looking forward to continuing my dedication to students and members of the SFA community, and I appreciate this opportunity." Childress' first official Board of Regents meeting will take place July 23 through 24.